From the left, Cathy Rhodes, Erma Zumpfe, Jenna Rhodes, Roma Rhodes and Sue Kittinger visiting Jenna in Coast Rica. 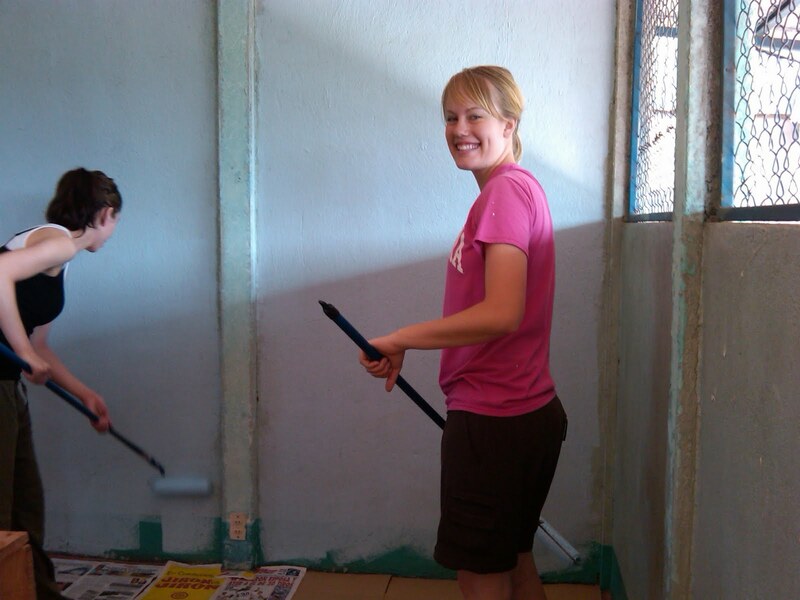 Jenna volunteering at a school in Costa Rica. Exeter-Milligan graduate Jenna Rhodes recently spent part of her junior year in college abroad. Just not abroad in the way most people think of it. Rhodes spent four and a half months living in Heredia, Costa Rica. She lived with a Costa Rican family or tico’s as they’re called and totally immersed herself in the culture and language of the country. Rhodes participated in the International Student Exchange Program (ISEP) program. She was part of a group of 20 students from all over the United States who studied at the Universidad Nacional in the town of Heredia where they lived with host families. Squeezing 17 credit hours in was more difficult than it sounds because they were all in Spanish. Yes, one class was a Spanish language class with all of the exchange students, but the others were content courses. Rhodes had health and environment, indigenous ecology, the culture and development of Latin America and a dance class all taught in Spanish with Spanish textbooks and assignments. She also had visitors in the form of family members while she was there. Her parents, Steve and Cathy Rhodes, visited in March and then her Mom, her Aunt Sue Kittinger, and both of her grandmothers, Erma Zumpfe and Roma Rhodes, came for her 21st birthday in May. 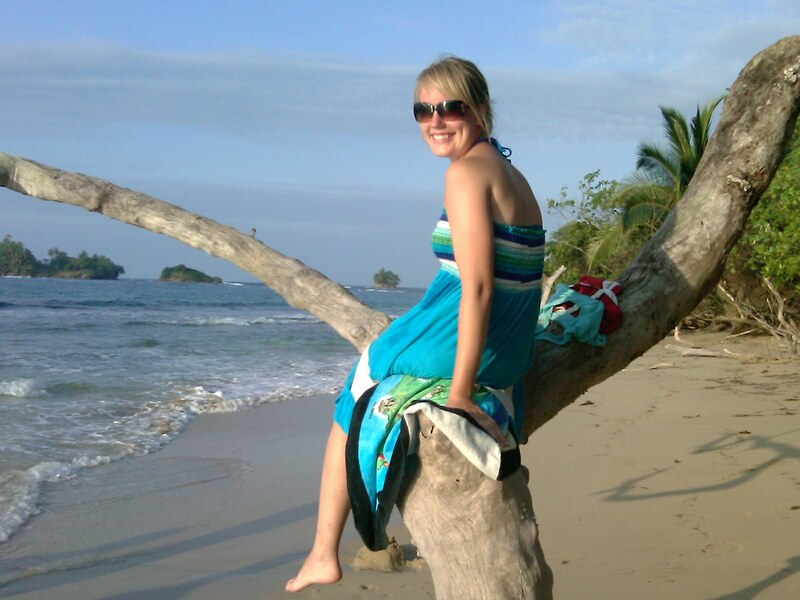 They had a fantastic time meeting her host family and experiencing the food, culture and scenery in Costa Rica. Probably one of the most important aspects of the experience for Rhodes were the friendships that she made while she was there. In addition to befriending her host family and fellow students, she made friends wherever she went, from the coffee shop where she studied every week to her fellow classmates. Her host family included her in all of their extended family events as they considered her a part of their family. She shared the home of her host family and their meals. The food, according to Rhodes, wasn’t what we typically think of as Mexican food. The food wasn’t spicy and they “ate a lot of beans and rice and fish.” Typically in the afternoon they would enjoy "pan y cafe" which is coffee and bread and then have a late supper. As part of the ISEP program, Rhodes and her fellow exchange students enjoyed many of the tourist activities in Costa Rica like ziplining, going to beaches, tours of a pineapple plant and cacoa plant, rainforest tour, para sailing, dolphin watching, and snorkeling. During Spring Break the group took a trip to some islands off Panama which were right over the border from Costa Rica. While these trips were a lot of fun, Rhodes and the other exchange students also spent some weekends trying to make a difference in the country. Three different weekends they spent volunteering in smaller communities, San Gabriel where they taught English and got to teach the kids fun songs on a Friday. On Saturday they painted the school. They also taught English in the town of Montelimar and spent the next day cleaning the school. The final service project was in the town of San Isidro. This project was much more about physical labor as they scooped manure into bags, loaded it in a truck and spread it onto the soccer field to create a rich topsoil on which to plant grass. In fact, Rhodes plans to finish her senior year at Nebraska Wesleyan and then pursue an accelerated Master’s teaching program in Curriculum Development and Instruction which will allow her to teach both Spanish and Social Science.